Martin Foster's Fuel Service has been operating in the Marlow and Duncan Oklahoma areas since 1956. Our 50+ year history of providing safe, reliable propane to homes and businesses will make you feel confident in choosing us for all of your propane needs. We strive to keep our prices competitive with other dealers in your area who are basically selling the same product. 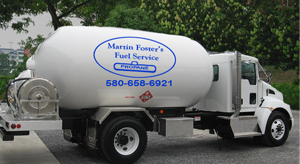 The difference in choosing Martin Foster’s Fuel Service as your propane provider is that you will be gaining the quality service, experience and propane knowledge that has kept our business growing for fifty-four years. Experience the difference that quality of service makes!